The holidays are closing in and the new year will be upon us in no time. Insted of waiting until Dec. 30 to buy a day planner and get myself organized, I'm going to try something new. No more procrastination. I'm getting things put together early so when January rolls around, I won't have to clean out my purse. One way to do that is to get a folio of some sort that can store your laptop or tablet, headphones, chargers, cell phone, business cards, a notebook, and more. Making it a stylish one is even more inspiring. That's where This is Ground comes in. 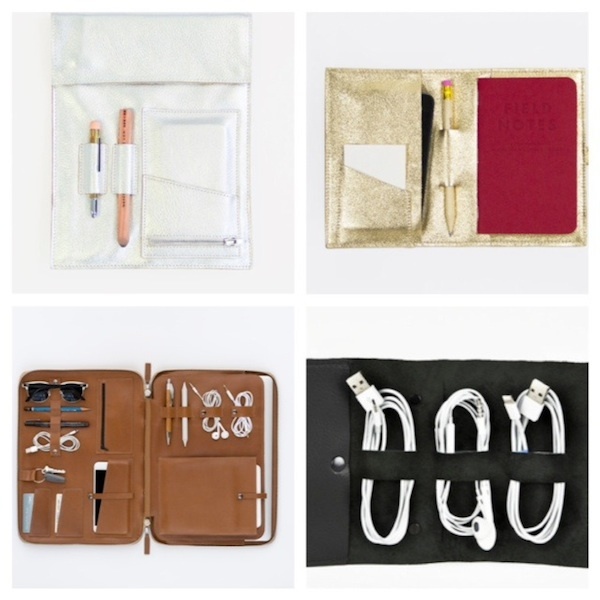 The company has created a slew of stylish, innovative, organizational products including a laptop case (lower left), the "Cordito" (lower right) which is a rollout case for cords, the "Cargito Air Charging iPad Case" (upper left) which includes a battery pack, and the "Leatherback Writer 2" (seen in gold, upper right), which houses your phone and a notebook. I'm especially eyeing the Leatherback Writer 2 in gold as well as the Mod Tablet Air (for the iPad Air), to get my life in order for the new year.